WINSTON-SALEM, USA — Brian Boyenger of Winston-Salem and Vika Aksonova of Ukraine want to get married. The U.S. government won’t let them — not in the United States. Brian Boyenger and Vika Aksonova. Boyenger said U.S. Embassy officials in Ukraine have not approved a request first made in August by his fiancée for a visa to enter the United States. Just as frustrating for Boyenger is that he does not know what he’s up against. Embassy officials have not explained why they have neither approved nor denied the visa request. Rather, the case has been sent to U.S. Citizenship and Immigration Services for further review. So Boyenger, 29, a disabled Iraq War veteran, left his job stocking shelves at a local grocery store to move to Ukraine. There, he’ll marry Aksonova, 28, and figure out the rest as it comes. Boyenger said he would like to return to Winston-Salem with Aksonova. Living in the area are his relatives and some of hers, including her mother and sister. But there are no guarantees that their wish of living together, married, in the United States may ever happen. Such are the vagaries of the U.S. immigration system. “If I have to, I’ll stay there,” Boyenger said. “How can you overcome their objections if you don’t know what they are?” Boyenger asked. “Nobody talks about legal immigration,” he said. Boyenger and Aksonova have been in a relationship since August 2015 when Boyenger met Aksonova’s sister at a concert in Raleigh. They have spoken mostly online but met in person in January 2016. Aksonova liked how Boyenger treated her, she said in Russian this week during a phone interview, translated by her sister, Iryna Butsch, who lives in Kernersville. Boyenger asked Aksonova to marry him April 10, 2016, in Kharkov, Ukraine. On a cold February day, Aksonova spent several hours at the U.S. Embassy in Kiev answering questions about their relationship. She had applied for a K-1 visa, the kind that is routinely conferred for a spouse or fiancée. Aksonova spoke with four embassy officials, one at a time, for more than four hours. She finally broke down crying when, during the final interview session, she was told that she had not provided sufficient proof of the relationship. “I felt devastated. Upset. Hungry. Thirsty. And I had to go to the bathroom,” Aksonova said. Boyenger’s efforts to get support from U.S. Sen. Richard Burr and U.S. Rep. Virginia Foxx have been fruitless. Aides for Burr and Foxx have told him that such applications are “confidential,” Boyenger said. Once the application file gets sent to U.S. Customs and Immigration Services, he added, there is little that can be done. 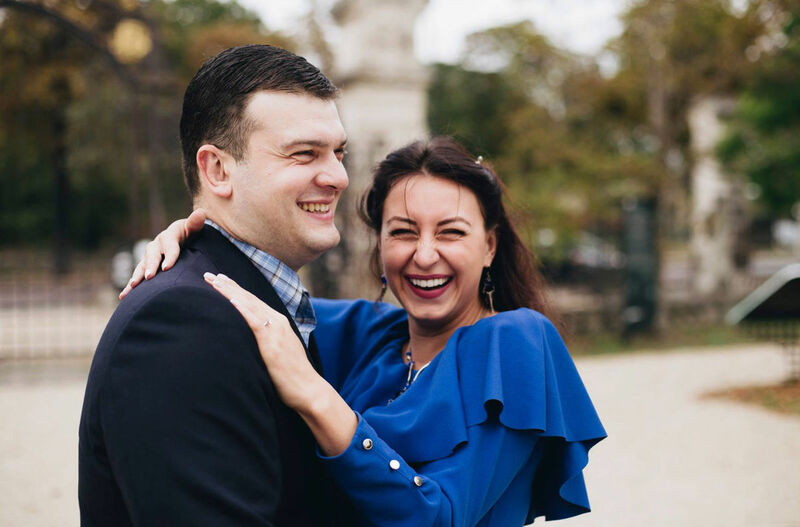 In an email exchange involving U.S. Embassy officials, provided to the Winston-Salem Journal, there is little information that Boyenger can use to prove that he in fact wants to marry Aksonova. From the Immigration Visa Unit of the U.S. Embassy’s Consular Section, an unidentified embassy official said their handling of the case has been correct. The writer also said that “there appeared to be differences between some of the information provided to you by Ms. Aksonova and her family members and the information that we collected in Ukraine, which included a visit by our staff to her place of residence. Boyenger would like to know — not because he thinks that Aksonova has misled him in some way but because he would like to correct the record.